Marketing’s role as the primary ‘growth antennae’ for organizations is strengthened using data. CMOs are in a unique position to turn consumer insight into the next commercial opportunity and new sources of revenue. 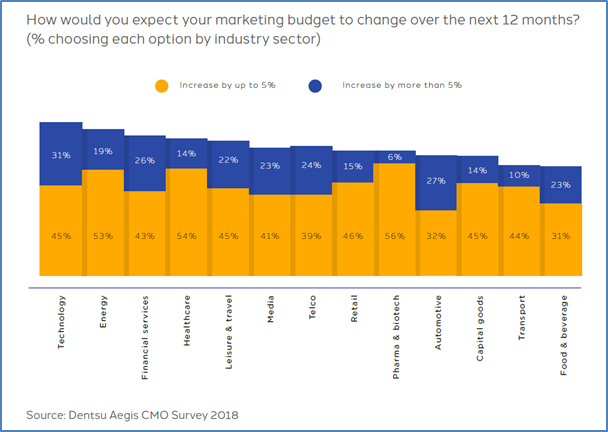 Stating that marketing investment is on an upward curve, Dentsu Aegis Network’s ‘CMO Survey 2018’, indicates that six in 10 marketers expect marketing budgets to rise in the next 12 months. But it’s budget increases among larger corporates that stand out, with 43 percent of respondents planning for increases of 5 percent or more and just one in 20 expecting to see budgets fall. Confidence is highest among technology, automotive and financial services CMOs. The survey also suggests CMOs are facing significant challenges as they attempt to balance the opportunity to build new capabilities and enhance their role, with the risks and challenges driven by data and the digital economy. The evolution of marketing data towards real people, building on digital proxies and broad customer segment data, is identified as the number one strategic opportunity for CMOs over the next 2-3 years, with 80 percent of CMOs also recognizing its importance to effective customer engagement. However, the findings also reveal a substantial degree of caution. Suffering a data breach is now the leading strategic risk identified, while a high proportion of respondents (60%) believe that data protection legislation such as GDPR will make it harder to build direct relationships with consumers. “There’s a clear shift, as senior marketers adapt to a digital economy characterized by customer-led demand, near perfect competition and where competitive advantage rests in how well you know your customers. CMO perspectives are moving away from short-term investment in tech, apps and platforms towards what really matters – digital transformation that orientates the whole business around customers,” said Nigel Morris, Chief Strategy and Innovation Officer at Dentsu Aegis Network. Investment is expected to rise, but the survey reveals changing priorities, reflecting the increased focus on data as an enabler of growth. Investment in digital media, in-housing of marketing capability and a growing role for specialists are all high on the investment agenda. Just over one-third of CMOs identify ‘leading disruptive innovation’ as one of their core functional priorities. US CMOs are significantly more focused on innovation (46%) while CMOs in the UK are well adrift of the international average (25%). “Data is central to creating deeper customer relationships and understanding and the most successful marketers have recognized that the key to strategic business growth is in their hands. This has the potential to transform marketing’s role as the architect of a business’s long-term vision,” Mr Morris said. Next Post: Can We Trust Facebook To Make Our Time ‘Well Spent’?